To say that Jeffrey Deitch has had a hand in shaping today’s contemporary art world is a vast understatement. Known for his sharp eye for talent as well as his trademark round spectacles, the curator, dealer, writer and former director of the Museum of Contemporary Art, Los Angeles (MOCA) has been credited with propelling some of contemporary art’s biggest names—including Jeff Koons, whose 50th birthday party he organised—to global stardom. A true mover and shaker, Deitch also brought Andy Warhol to Hong Kong for the first time in 1982; Warhol captured their excursions around town from the Peak to the Mandarin Oriental hotel in a series of striking black-and-white photos. Last year, some of these photos went under the hammer at the ‘Warhol in China’ auction hosted by Phillips. Deitch now has his eye on another booming city in the art world—Los Angeles—where he will be opening a gallery this September with an inaugural show by none other than Chinese artist and activist Ai Weiwei. 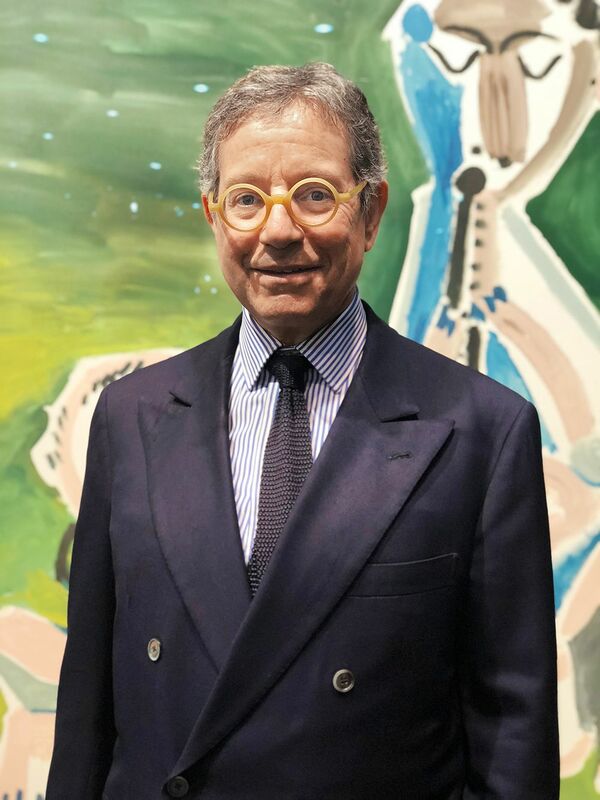 We caught up with the ebullient Deitch during his recent trip to Hong Kong as curator of the exhibition ‘Modern Figures’ at Luxembourg & Dayan’s booth at Art Basel in Hong Kong. What can we expect at your new gallery opening this September in Los Angeles? I’m opening with Ai Wei Wei. He’s an artist with a following beyond just the art world and I want people who are interested in world affairs and refugee crisis and such. We will have the space to do museum-level exhibitions. Instead of monthly shows like the traditional gallery model, we will have a museum schedule, which will be more ambitious. I’ve actually only programmed one year. I want people to see the space. I don’t want to programme it out three years in advance; I want to have some spontaneity. There is lots of talk about Los Angeles being the next ‘it spot’ for the art world. Do you think that’s correct? That definitely is correct. Every few weeks I hear of another ambitious young artist who’s moved there. The cost of having a studio there is moderate, so an artist doesn’t have to be in that cubicle in the basement. In New York City, a number of the industries that support artists like metal fabricators and plastic fabricators have gone out of business. In LA, these businesses are still thriving. Artists can still find good fabrics there. What about Asia—do you have any thoughts about the Asian art market? Oh, it’s so inspiring. For the past several years I’ve been visiting Shanghai. It is amazing to see the development of art there, from a few years back when there were very few art spaces. ART021 Shanghai Contemporary Art Fair and West Bund Art & Design Fair were incredibly dynamic. In terms of the global economy, this is by far the most dynamic region. I’m also impressed by how hard this young audience is working to learn. Almost every gallery has staff of young people fluent in international languages who are able to talk very articulately about the art. You see people taking photographs of the labels so they can look up who the artist is and research. In the United States, contemporary art is the arena is where interesting people from different fields meet. The famous financiers, movie and music stars, tech geniuses—they connect in the art world. Something similar is happening here. It’s a very special community that is being built around the art. What does good art mean to you? On the first level, a great work of art just has tremendous visual impact. The first ten seconds you’re struck by the visual power. It resonates, and you remember it the next day and beyond. What separates a strong image from the truly great work of art is that the latter is always an abstraction of ideas and concepts. Brilliant artists are great intellectuals with the intellectual power of someone who writes a book of philosophy or a great novel. Tremendous thought goes into the development of an artistic vision; it’s a combination of someone’s personal experience, culture, reading, the other art they’ve seen, and their distillation of art history. So it’s not just visual; the best art you can talk about for hours, even years. I started talking about works of Picasso 40 years ago and there’s still more to say. The best art is timeless. Tell us a bit more about curating for Luxembourg & Dayan’s booth ‘Modern Figures’ at Art Basel in Hong Kong. I’m old friends and Amalia Dayan and Daniella Luxembourg; Amalia was an intern at my gallery but quickly became a director as she was so talented. They knew I was interested in this topic and asked me to help assemble the work for the booth and give it an intellectual framework. I’ve also been involved in writing a book on new figurative paintings and it’s gotten me into thinking of its history; that's where [the ideas for Luxembourg & Dayan’s booth] come from. There will be a thesis about ‘wrongness’ in modern figuration: the ‘right’ way which is more Pablo Piccaso and Henri Matisse, and a ‘wrong’ way which is a strain from Francis Picabia to Giorgio de Chirico. Many of great contemporary artists who did it the ‘wrong’ way, like Picabia, are very esteemed by the emperors. For this exhibition, we have artists on the 'right' side, like Picasso, and we found two very interesting Picabia transparencies, a Balthus, a de Chirico. I wanted to present this interesting new view. You’ve curated several projects at art fairs recently—this booth for Luxembourg & Dayan and the JR work at The Armory Show in New York. What do you like about art fairs? The idea of an international festival is something very deep in civilization and the art fair is a very contemporary manifestation of that. Art Basel in Hong Kong might be the most international of all the fairs because people come in from all of Asia, Europe, America. It’s very efficient to get an overview of some of the best Asian art. They do a very good job of making sure they have the best Asian galleries here.